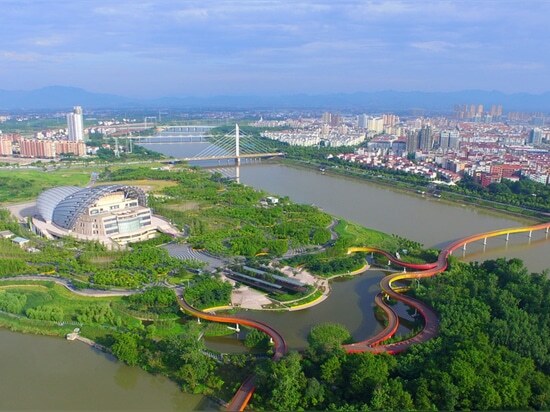 News & Trends> Inspiration > Public buildings > Terraces of plants in Yanweizhou Park "control floods in an ecological way"
World Architecture Festival 2015: in this exclusive movie, Andrew Buck of Turenscape discusses the flood-resistant topography of the Chinese landscape firm's award-winning wetland park in Jinhua, China. 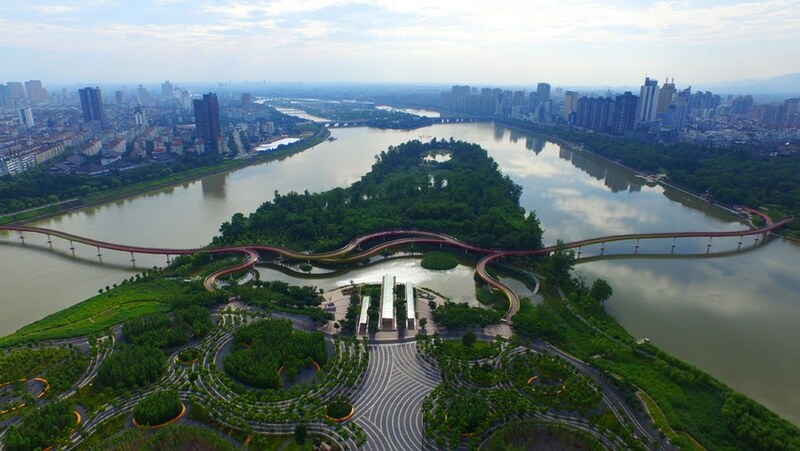 Yanweizhou Park, which was crowned World Landscape of the Year at World Architecture Festival 2015, is a 26-hectare wetland park at the mouth of three rivers in China's Zhejiang Province. The site was previously dominated by an unattractive concrete flood wall. Buck says the key to the project was finding a way to remove this wall without compromising flood protection. 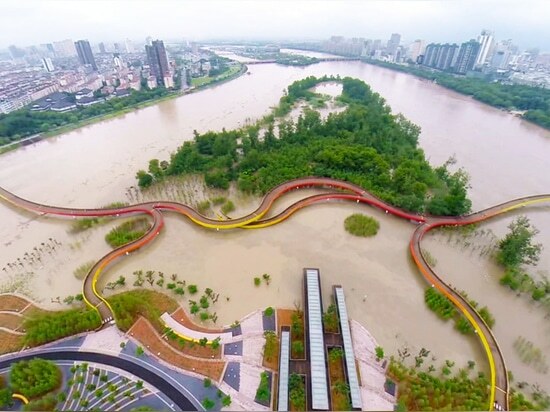 "The flood wall just destroyed the natural ecosystem for the area," he explains in the movie, which was filmed by Dezeen at World Architecture Festival in Singapore. 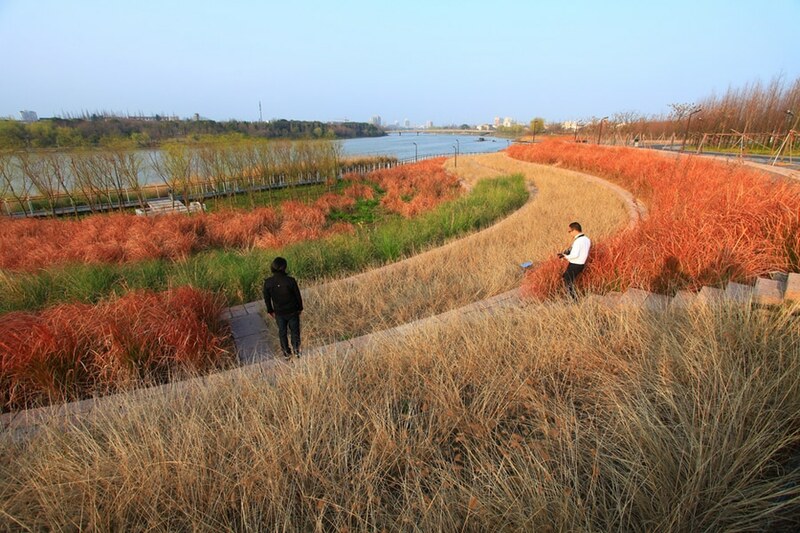 "What we wanted to do was replace it with a terraced embankment," he says. 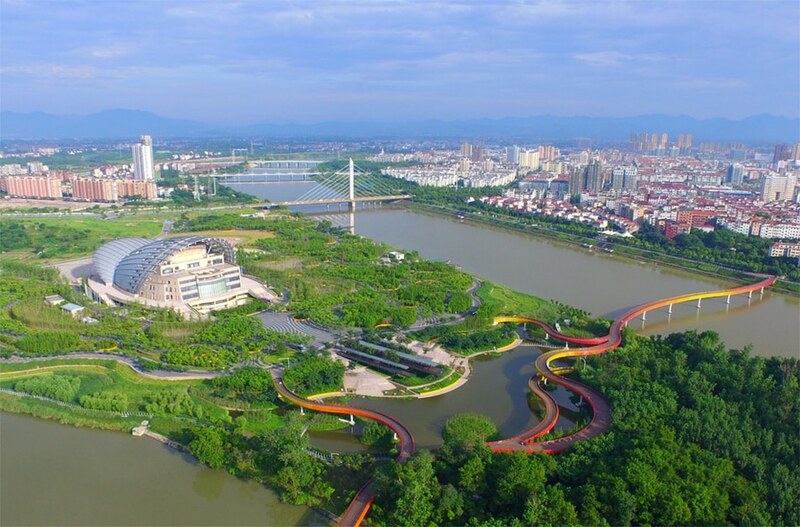 "Through doing that we were able to reconnect people with the waterfront, but at the same time we were able to control the floods in a ecological way." 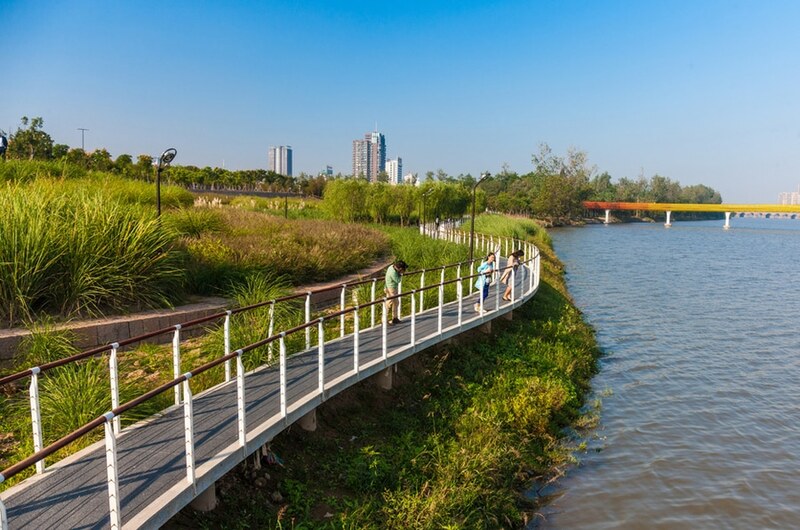 Rather than simply providing a barrier, the terraced landscape absorbs floodwater, which provides nourishment for the park's plants throughout the year. "The terraces slow, stop and absorb the floods," Buck explains. 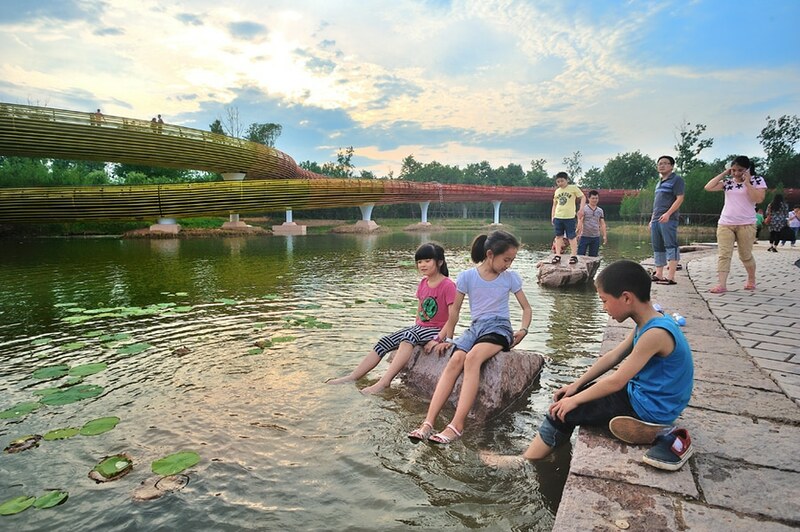 "They are able to absorb the floodwater, but also the nutrients from the silt." "So this whole landscape does not requite fertiliser, and it does not require irrigation either." 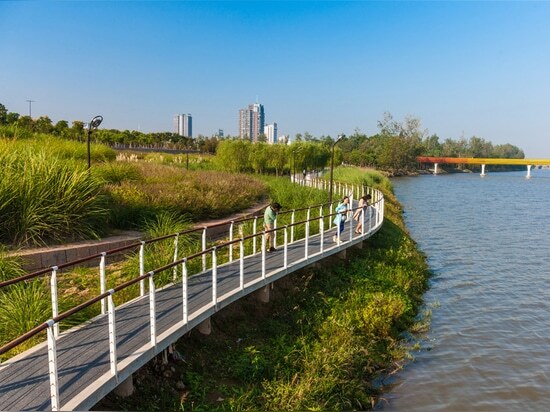 The park features a network of meandering raised pathways and bridges, which allow visitors to freely explore the area in the wet season. 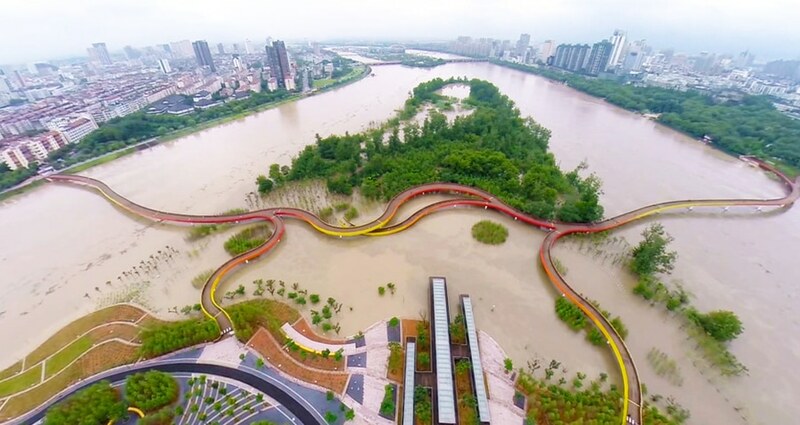 A red and yellow pedestrian bridge snakes across two of the 100-metre-wide rivers, which Buck claims can "withstand a 200-year flood" – a flood with a 0.5 per cent chance of happening in any given year. 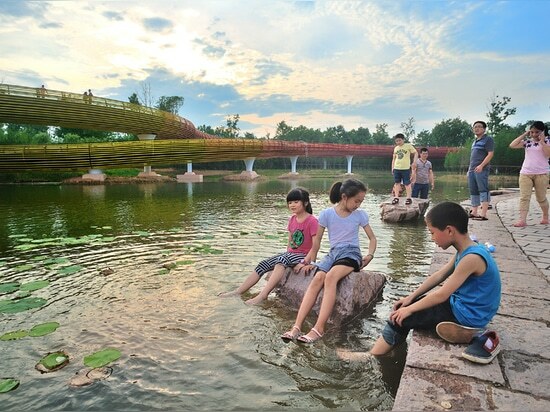 The distinctive form of the bridge references a local traditional dance called Bandeng Long, in which villagers construct a dragon from wooden benches and lanterns and dance with it through the fields. "The bridge has become a landmark for the city," Buck says. 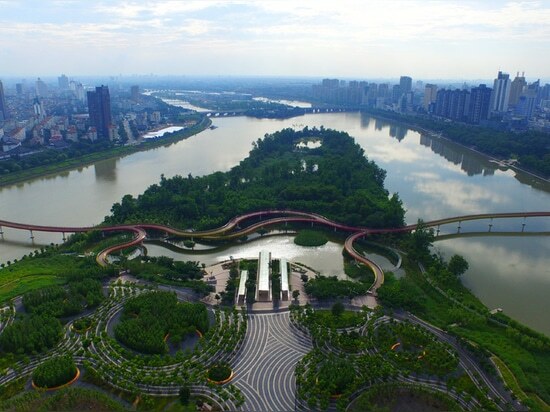 "The park attracts 40,000 people per day." This movie was produced by Dezeen for World Architecture Festival. 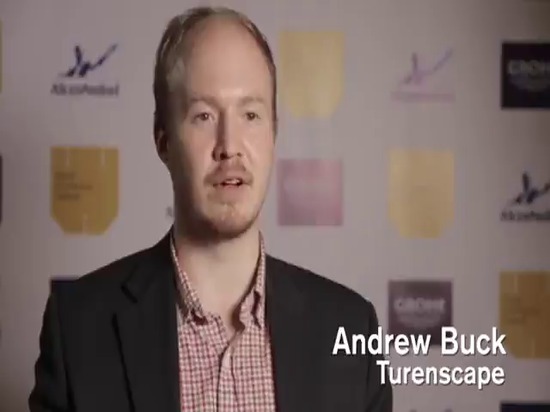 All photographs are courtesy of Turenscape.